I always liked Helena. All she wanted to do was hang out on her own and read. I sympathize. Helena: It’s come to my attention that some of you can’t find quality reading material…That’s a problem worth coming back from the dead to help with. 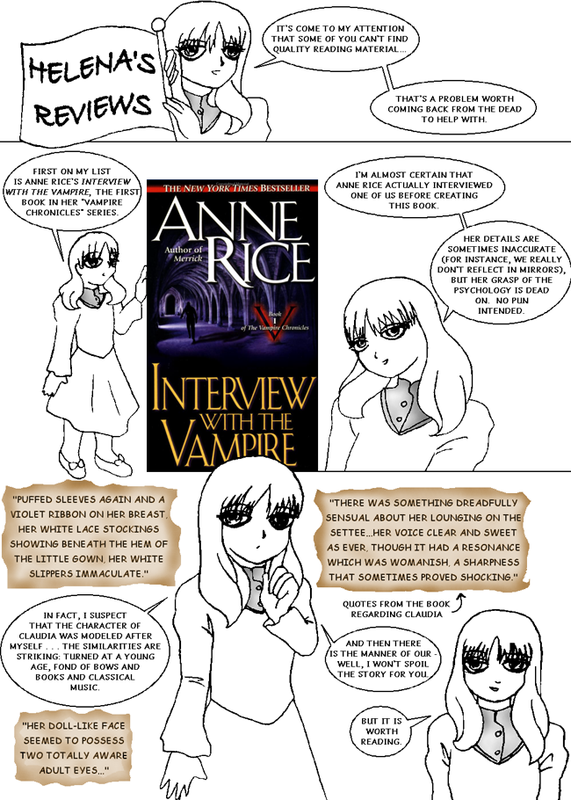 First on my list is Anne Rice’s Interview with the Vampire, the first book in her “Vampire Chronicles” series. I’m almost certain that Anne Rice actually interviewed one of us before creating this book. Her details are sometimes inaccurate (for instance, we really don’t reflect in mirrors), but her grasp of the psychology is dead on. No pun intended. Helena: In fact, I suspect that the character of Claudia was modeled after myself…The similarities are striking: Turned at a young age, fond of bows and books and classical music. And then there is the manner of our — well, I won’t spoil the story for you. But it is worth reading.